BETHEL – In the time that U.S. Interior Secretary Sally Jewell took to address the Alaska Federation of Natives Convention last week, she said, two African elephants were killed by poachers for their ivory. Dangling from her ears were polar bears carved by an Alaska Native artist from walrus ivory, which she said later was an intentional jewelry choice to show that federal agents recognize differences in ivory types and related threats to animals. African elephants, targeted by poachers and trophy hunters, are listed as a threatened species. The United States this summer strengthened rules into a near-total ban on any trading in elephant ivory. The Pacific walrus is a candidate for protection under the Endangered Species Act, but climate change is the big threat to that species, not poaching. 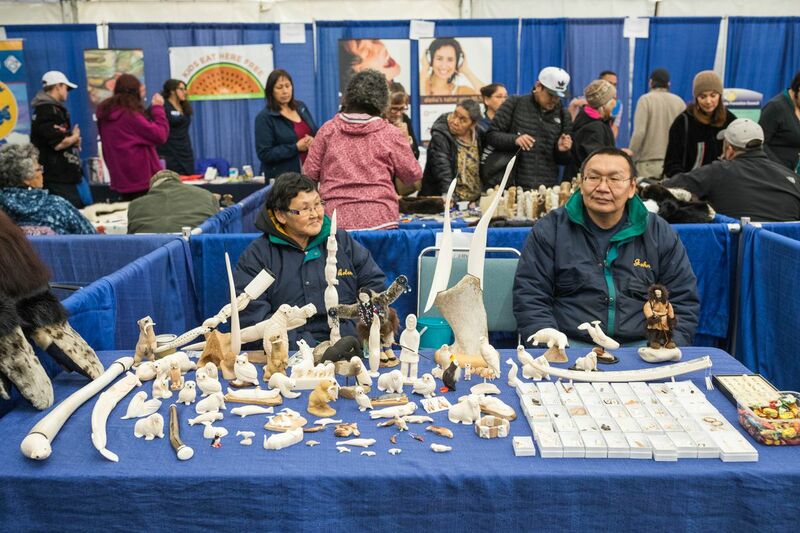 Under the Marine Mammal Protection Act, Alaska Native hunters can target walrus, Native artists can harvest, buy and carve their ivory, and anyone can purchase the art. Alaskans make ivory earrings that look like ulus and swans, salmon and tiny coffee cups. They carve long, smooth walrus tusks into seals, make masks that evoke halibut, and design miniature puffin rookeries. One artist, Susie Silook, who gripped the microphone at AFN to speak out on ivory, is known for her haunting, graceful figures carved from walrus tusks. Yet some states concerned about decimated elephant populations have banned walrus ivory too, creating anxiety for Alaska artisans, uncertainty for buyers and an agenda item for politicians. The issue surfaced on stage and off at this month's AFN convention in Fairbanks, even as impacts on Alaska remain uncertain. "It's not just the craft shows. Just look at downtown Fairbanks in terms of what they sell," U.S. Sen. Dan Sullivan said at a field hearing he held as a side event to AFN. "While data is limited on the full economic impact of these activities, what is clear is that many in rural and even urban Alaska receive significant economic benefits from working with and selling these products." Already customers are backing away. Cruise ship tourists, worried that all ivory is illegal, are saying they won't buy it, Sullivan said. At AFN, Kawerak Inc., a Nome-based regional Alaska Native nonprofit, distributed "I heart Ivory" cards that warned the bans could lead to prosecutions for items legally bought in Alaska. It urged action to allow art from walrus, mammoth and mastodon ivory. "Post a ivory selfie with #iloveivory on your social media," Kawerak suggested. Silook told AFN that the Obama administration strengthened the ban on elephant ivory without even consulting tribes because the government didn't think they would be affected by restrictions on "blood ivory." Now states are going even further, she said. "All in the name of saving elephants we will never see in our lifetime," Silook said, reading from a letter she sent to Obama. They are wonderful animals, she said, but people in remote villages care about their walrus, seal and other animals, too. Walruses were once over-hunted by Europeans but have recovered, she said. "Proving our sustainable use does not cause endangered status," she said. A Facebook group called Sikuliiq, a Siberian Yup'ik word for new thin ice along the edges of old floes, has been formed to advocate for traditional Alaska Native artists. In the AFN art pavilion, Clifton Smith was among a number of Alaska Native artists selling ivory masks and jewelry as he worried about what may come. "I really want to know what is going on with that," said Smith, 47, who now lives in Akiak but grew up in the village of Mekoryuk on Nunivak Island, where his father — sitting beside him at AFN — taught him to carve. He said he heard he won't even be able to purchase raw ivory. That isn't true, but demonstrates the depth of the confusion surrounding ivory. A friend from Gambell on St. Lawrence Island provides his ivory, said Smith, a father of five who tried college and cutting hair before committing to carving for his living. Walrus ivory might go for $50 a pound, said another artist, Bryon Amos. Grace Singh of Juneau admired the unusual curved design of his earrings and settled on a pair for $70. "Walrus ivory is completely appropriate," she said. The two states with the biggest ivory markets have put in place their own bans: California, which is being sued over it, and New York, where walrus ivory is not banned but mammoth ivory — also popular with Native artists — is outlawed. New Jersey approved a ban that covers walrus ivory, as did Hawaii. Massachusetts and Florida are among the states still considering legislation. Few criminal cases have been brought so far. In California, where the new law is intended to close loopholes that allowed the elephant ivory trade to flourish in San Francisco and Los Angeles, the ban covers "a tooth or tusk from a species of elephant, hippopotamus, mammoth, mastodon, walrus, warthog, whale, or narwhal, or a piece thereof, whether raw ivory or worked ivory." The law, which took effect July 1, exempts antiques at least 100 years old that contain minimal amounts of ivory — like old gun grips — as well as pianos and other musical instruments built before 1976. There is also an aspect that could benefit Alaska. The new measure says that activities specifically authorized under federal law such as the Marine Mammal Protection Act would still be allowed. "As long as what's going on is on the up and up with those laws … then they should be OK," said Lt. Chris Stoots of the California Department of Fish and Wildlife, who spent a few hours Wednesday looking into the interplay between federal law and the state ban. "This being new to all of us." That wording isn't specific enough to clearly exempt traditional Alaska Native arts and crafts even though they are allowed under federal law, says U.S. Sen. Lisa Murkowski. She wrote to California Gov. Jerry Brown in August asking him to work with her to clarify it. As it stands, Congress might need to pass a "preemptive" law to override state laws and ensure Native people can continue as they have with ivory arts and crafts, Murkowski wrote. The Ivory Education Institute, which advocates for ivory collectors, has sued to block the California law and points to its impact on Alaska artists as one reason. Figures on poached elephants are inflated and southern African countries with shrinking habitat are overrun with elephants, said its managing director, Godfrey Harris. The California department's law enforcement division is creating a wildlife trafficking team "to specifically combat the illicit trade of wildlife and their parts with rhino horn and ivory as a priority," Capt. Patrick Foy of the division said in an email. The new law bans trade; authorities say it is not intended to create criminals out of individuals over what is in their home, as long as they don't intend to sell it. The department is working on public information outreach and hasn't yet brought any cases, Stoots said. In New York, where an ivory ban took effect two years ago, about a dozen criminal cases have been brought. None involve walrus ivory, which isn't banned, said Joe Therrien, a New York Department of Environmental Conservation wildlife biologist. Ivory sellers now must pass a much more rigorous review to receive a license, which few get, he said. Last month, New York authorities seized some 126 elephant ivory items from an antique store including two pairs of uncarved elephant tusks priced at $150,000 and $200,000, part of a $4.5 million ivory inventory and the biggest seizure in New York history. The case began when undercover officers bought a $2,000 carving being sold as mammoth ivory that turned out to be from an elephant. Mammoth ivory — which isn't protected under federal law, given that the animal is extinct — is banned because it is hard to distinguish on sight from elephant ivory, Therrien said. The crackdowns are intended to stop dealers from selling newly poached elephant ivory disguised as antique or mammoth ivory. Walrus ivory looks far different, said Rory Stark, assistant special agent in charge for the U.S. Fish and Wildlife Service in Alaska. "It has to do with the texture of it," he said. Elephant and mammoth ivory features cross-hatchings known as "Schreger lines." Walrus ivory has sort of a marbled or oatmeal-looking substance in the middle. "It's very easy to tell the difference," he said. Raw ivory from a hunted walrus must be tagged and the tag travels with it until it is turned into handicrafts or art, Stark said. Before it can be sold, the ivory must be "significantly altered" and then is no longer tagged, he said. Jewell, the Interior secretary, said walrus ivory art may need some sort of authentication or government stamp of approval that travels with it down the line. Such a condition may meet resistance. "Many of the artisans are in remote villages. We want to make sure it is easy for them to comply and not difficult," she said. U.S. Rep. Don Young, who decorates his Washington, D.C., office with animal trophies, told AFN "this ivory thing has got me really worked up." If anyone from the government is telling carvers they can't do their work "we're going to put a stop to that," Young said. Not that he is happy about the elephant ivory ban either. He hasn't hunted elephant but said he believes regulated hunts when populations are healthy enough help save the animal, in part by providing money for conservation. A ban won't stop poachers and hurts those who already own ivory-laden heirlooms, jewelry, guns and musical instruments that fall outside the new rule, he said. He has proposed legislation to roll it back. Sen. Sullivan said he intends to talk to his colleagues in other states to encourage them to ease up. At his Senate hearing in Fairbanks, the panel included Native corporation leaders, a subsistence expert, an artist and the World Wildlife Fund's Arctic program director. It's remarkable, Sullivan said, but all agreed there needs to be new attention on Native artists and their legitimate work with walrus ivory.